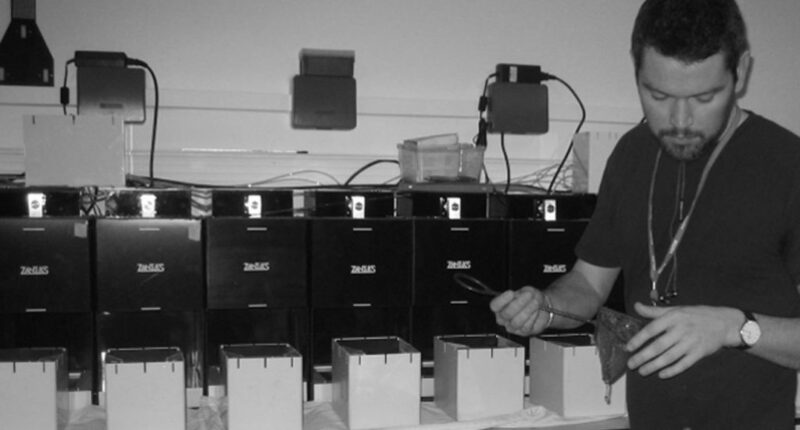 The Zebrafish Neurobiology and Behavioural Genetics group at Queen Mary, University of London, led by Dr Caroline Brennan, is using the Zantiks AD system to investigate the genes affecting working memory and age-related cognitive decline, using zebrafish as the model organism. Zebrafish are ideal for identifying genes related to cognitive ageing because they share a majority of the same genes with humans and can perform behavioural tasks similar to those used in mammals and humans to assess cognition. Despite this, zebrafish research has been limited due to the lack of an automated set of high-throughput tasks. To carry out a large-scale genetic screen in adult zebrafish, the researchers at Queen Mary required an automated system capable of analysing complex cognitive behaviours in fish. Using the Zantiks AD system, Dr Alistair Brock was able to train various genetic lines of zebrafish in behavioural tasks commonly used to assess short-term memory (matching to sample) and response times (5-choice serial reaction time, 5-CSRTT), at 2 different ages: young (6 months) and old (2 years). The systems facilitated quick and efficient execution of the task. Zebrafish were trained to perform 3-choice discriminations within 3 weeks, 5-choice discriminations within 5 weeks and 3-choice matching-to-sample within 8 weeks. This work has enabled demonstration of several genetic lines of interest that show significantly altered learning performance. This work will continue the screen and further characterise the genes involved. More information on the Zebrafish Neurobiology and Behavioural Genetics group at QMUL can be found here. Brock, A.J., Sudwarts, A., & Brennan, C.H. (2016, November). The use of zebrafish to identify genes affecting working memory and age related cognitive decline. Poster presented at annual meeting of the Society for Neuroscience, San Diego, CA, USA. Brock, A.J., Sudwarts, A., Daggett, J.M., Parker, M.O., & Brennan, C.H. (2017). A fully automated computer based Skinner box for testing learning and memory in zebrafish. bioRxiv doi:10.1101 1110478. A fully automated computer based Skinner box for testing learning and memory in zebrafish (bioRxiv, March 2017)– describes detailed protocols for two automated tests of learning and memory in adult zebrafish using the Zantiks AD unit. This work, mainly conducted by Alistair Brock out of Caroline Brennan’s lab, was designed along the lines of a rodent operant box and demonstrates comparable representative results from a Pavlovian fear conditioning task and a 5-choice serial reaction time task (5-CSRTT).